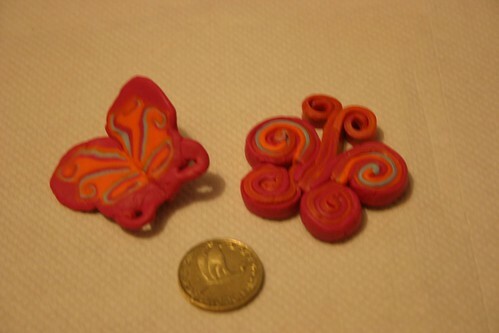 I have made beads for female relatives as 21st birthday gifts. This one was for my cousin who likes the colour pink. I made a buterfly shape cane from the clay and cut slices to cover the large round beads. 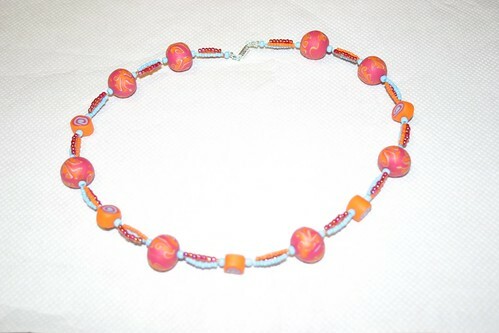 The medium sized beads are simple jelly rolls and the small ones are puchased craft beads. My orinal idea was to have a larger butterfly pendant with beads dangling off it, but I wasn’t happy with how the butterfly turned out, so left it out. Here is the butterfly, and another attempt from scraps.